You'll be £10.00 closer to your next £10.00 credit when you purchase First World War Uniforms. What's this? View any image of a Tommy and his uniform becomes an assumed item, few would consider where and how that uniform was made. Over 5 million men served on the Western Front, they all required clothing. From August 1914 to March 1919, across all theatres of operations, over 28 million pairs of trousers and c.360 million yards of various cloth was manufactured. Worn by men of all ranks the uniform created an identity for the fighting forces, distinguished friend from foe, gave the enlisted man respect, a sense of unity whilst at the same time stripping away his identity, turning a civilian into a soldier. Men lived, worked, slept, fought, survived and died in their uniform. Using the authors Great-Grandfather's war service as a backdrop, this book will uncover the textile industries and home front call to arms, the supply chain, salvage and repair workshops in France, and how soldiers maintained their uniform on the front line. Items of a soldier's uniform can become a way to remember and are often cherished by families, creating a tangible physical link with the past. But the durability of cloth to withstand time can create an important legacy. The fallen are still discovered today and remnants of uniform can help to identify them, at the very least the colour of cloth or type of hob nail can give the individual his nationality allowing them to be given a final resting place. A thorough and first-rate work on an aspect of the war very few of us ever spare a thought for, let alone know anything about. This well written book gives a most fascinating insight into the logistical effort required to fight the war, from sourcing raw materials through to manufacture and supply. Together with first-hand accounts, and using official documents and archive records, the reader is drawn into the past to achieve a better understanding of their ancestors' uniforms and what it took to create and wear them. Catherine is a fourth-generation dressmaker with a City and Guilds qualification in design, pattern drafting and garment construction, establishing her own bespoke dressmaking business in 2000. Combining a life long passion for history, family history and historical fashion led to her becoming a member of The Garrison Artillery Volunteers. Thus, beginning the interest in First and Second World War uniforms and fashion. 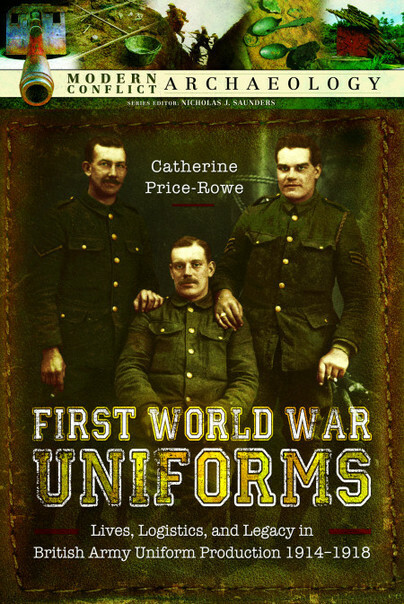 Engaging with the public, Catherine regularly attends events around Britain with displays on Make do and Mend, Finding the Missing, Uniform Production and Women at War.